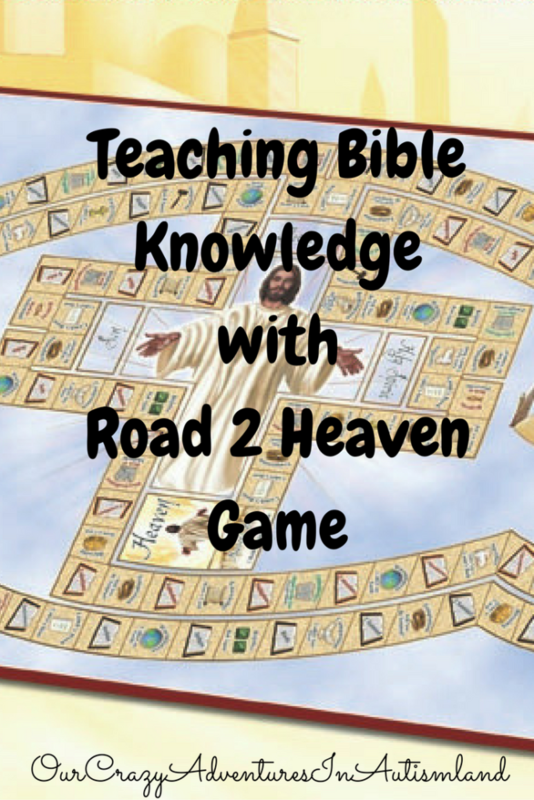 Reinforcing Bible knowledge with Road 2 Heaven game is one of my families’ favorite things to do. I love reinforcing any knowledge through games with my extremely visual kids. It’s not a secret that lots of children with autism learn best through hands on activities and visualizations. Learning abstract concepts like those found in the Bible can be intimidating for them to learn and for you to teach. Why not do it in a fun way as a family? The game comes with it’s own Bible which is the NKJV. My house personally prefers the 1984 NIV so I switched it out. There is absolutely nothing wrong with the Bible that comes with it. We keep it in the game box so when we take it to game night at church or to someone else’s house, there is a Bible in there. I’m just saying that we have a version the children are comfortable with so we stuck with that. It’s impressive that it comes with a Bible so you don’t have to hunt one to play the game. Why do you need a Bible you ask? Because one of the sets of cards ask Bible knowledge questions. In order to determine if the answer is correct, you have to look up the corresponding Bible passage listed at the bottom. There were some cards we knew the answer too already but I had the kids look up the Bible passage anyway. This gives them practice finding verses in the Bible but also teaches them that any answer they need can be found in that extraordinary book. If that is all my kids learn from this game then it’s worth every penny. We had a great time learning the books of the Bible as well as enhancing our Bible knowledge. It turned into a great conversation starter about some pretty tough concepts like grace and whether we could work our way into heaven. 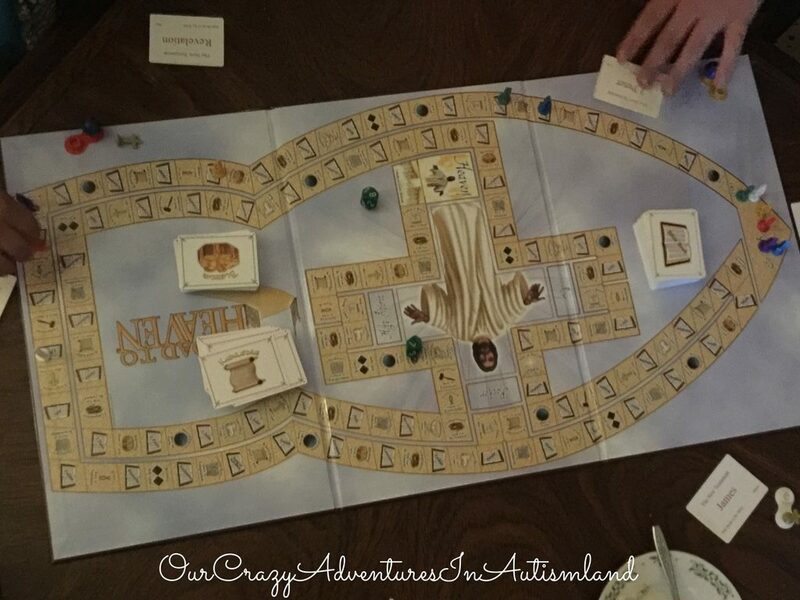 Games are an excellent way to introduce tough concepts to people with autism. Abstract concepts like faith are difficult for our kids to grasp. 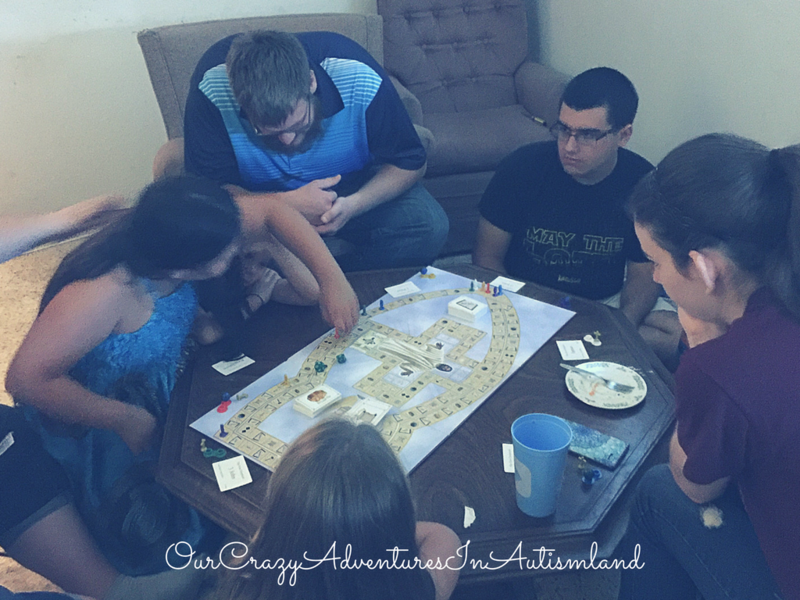 Games help to reinforce those key concepts in a habitual albeit fun way. Road to Heaven is a game that needs to be in your game closet. It’s a perfect way to check on what your child is learning in church as well as to keep honing in on the key concepts of the Bible. It makes a great gift that is educational as well as enlightening. Order a copy today!